The Jimmy Maladina Scandal You Didnt See! Jimmy Maladina is one of the country’s most influential figures. He is said to be the Prime Minister’s ‘Chief Adviser’, and stands over a vast business empire. Maladina was also at the centre of one of the country’s most epic scandals forensically documented by the Commission of Inquiry into the National Provident Fund (NPF). He believes that he has been under tremendous public scrutiny since 2000 when the NPF Inquiry began and his reputation and his family name ridiculed and badly tarnished. He has suffered with this bad image for over 15 years where people have labelled him a thief as a result. He has never gone out to public places and enjoyed himself but have restricted himself to his home for the last 15 years, virtually as a prisoner. Jimmy Maladina’s Facebook page paints a very different picture. 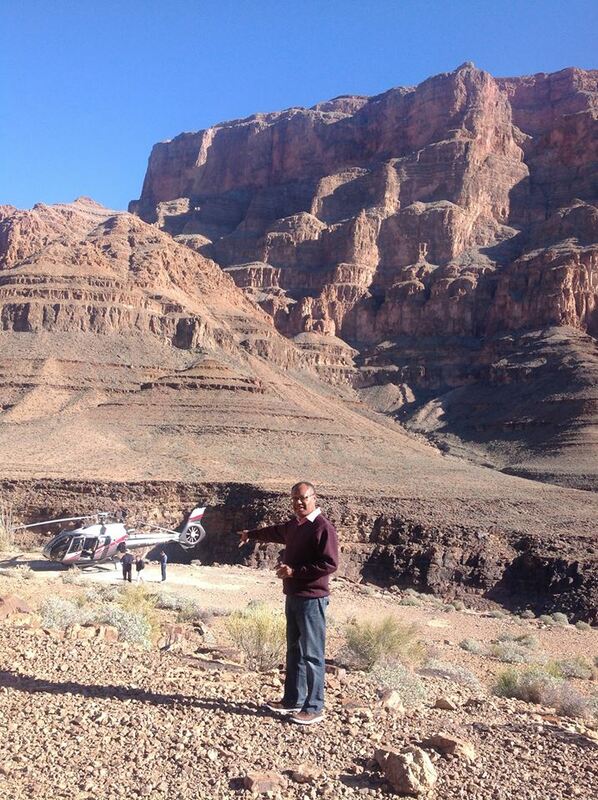 Overseas travel to glamorous destinations such as the Grand Canyon. Five star hotels. 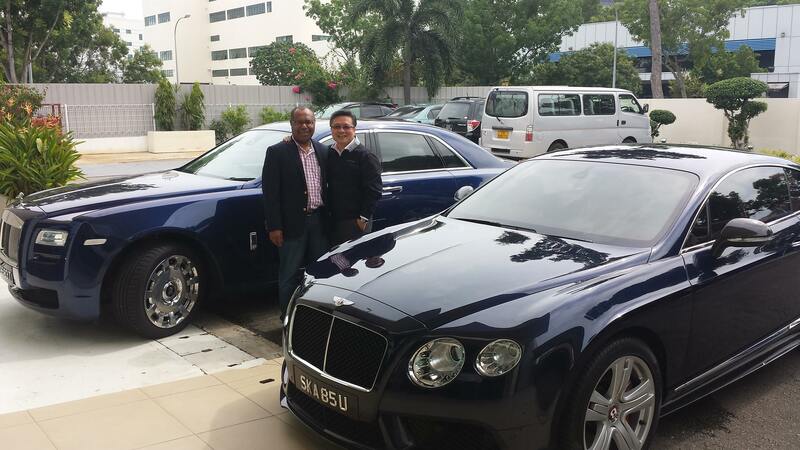 Riding around in luxury Rolls Royce motor-cars. And tailored suits. One Maladina scandal has been buried, until now. It begins in 1999 with Land Board Meeting No. 2017. Some 20 years later, Meeting No.2017 has legendary status, having been slammed in two Commissions of Inquiry. According to the Public Accounts Committee ‘this Land Board meeting is the most blatant example of fraud and criminal activity by the Land Board and certain of its Members’. Evidence before the Public Accounts Committee, the National Court and Finance Department Commission of Inquiry, suggests Meeting No. 2017 never took place. Yet this didn’t stop a company, PNG Deep Sea Fishing, from getting a 99 year state lease purportedly awarded at Meeting No.2017, by a Chairman alleged no less to have been bribed by Jimmy Maladina. The award to PNG Deep Sea Fishing did not raise eyebrows at the time as far as Maladina was concerned. When this illegal award was made, the company was owned by Andrew Kunjip and Nancy Kamor. In this investigation PNGi presents evidence which strongly suggests PNG Deep Sea Fishing was in fact controlled during this period by Jimmy Maladina and his wife, Janet Karl. When the Milne Bay Provincial Government attempted to claw back the property illicitly obtained from the public by PNG Deep Sea Fishing, Maladina and his wife formally acquired the company’s shareholdings and initiated seven years of litigation that ended in 2014. Lets look at how this caper unfolded. On 11 November 1999 an agenda for Land Board Meeting No. 2017 was gazetted. The first item on the agenda was an application by PNG Deep Sea Fishing for a 99 year Business (Commercial) Lease over Allotment 5, Section 59, Town of Alotau. It was incorrectly gazetted as Allotment 5, Section 56. Meeting No. 2017 was to take place on 10 December 1999. It was stopped by Lands Secretary, Morris Alaluku. The relevant paper-work had not evidently been processed by his Department. This fact was confirmed by the Acting Director of the Land Administration Division in testimony given before the Commission of Inquiry into the Department of Finance. Although the meeting did not take place, this did not prevent the Land Board Chairman, Sir Ralph Guise, from preparing meeting minutes and recommendations. This will be of no surprise to seasoned observers. Sir Ralph Guise was known for his dexterity in forging Land Board documents. For example, when the NPF Commission of Inquiry considered a Waigani land fraud, it concluded that Sir Ralph Guise was at the centre of this illicit land deal engineered by Jimmy Maladina. ‘Mr Guise and Dr Pok were involved in fabricating and gazetting false documents, preparing and signing false Land Board minutes and signing false and fictitious approvals‘, the Commission observed. It adds ‘Mr Maladina was responsible for bribing Land Board chairman Ralph Guise and Lands Minister Viviso Seravo, to ensure Waim No.92 was granted the lease of the Waigani Land on very favourable terms‘. In the instance of Allotment 5, Section 59, even though Meeting No. 2017 did not take place, Sir Ralph Guise sent to the Government Printing Office a schedule of granted applications ‘agreed’ to at the ‘meeting’. 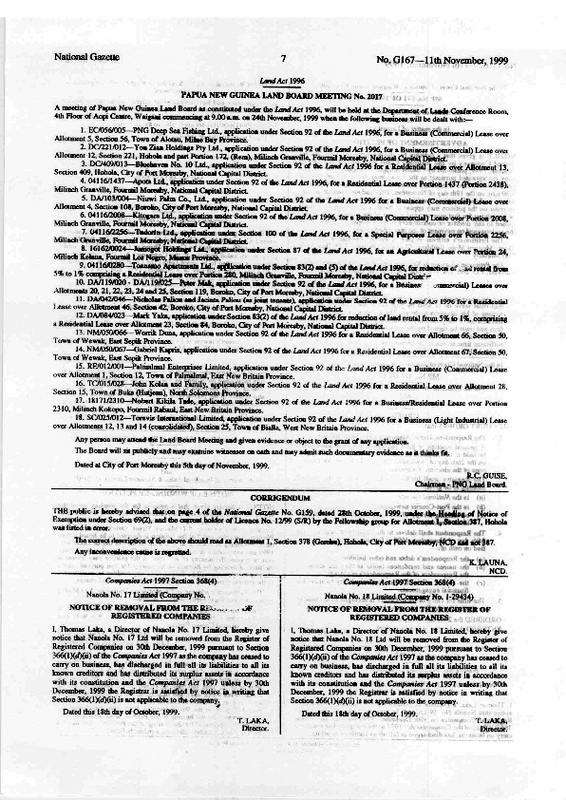 Lands Department intervention stopped this illegal gazettal notice from being printed, a fact attested to by the Government Printer in the Department of Finance Commission of Inquiry. 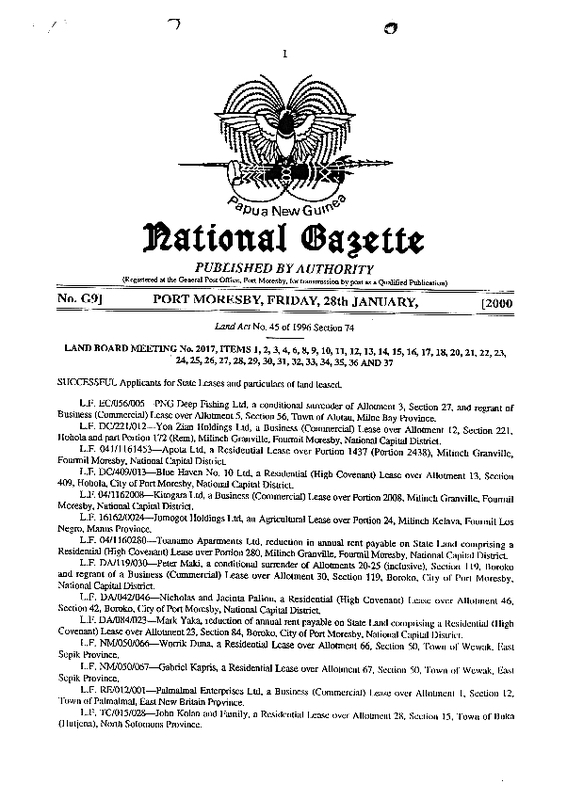 Nevertheless, copies of this illegal, unpublished gazettal notice found its way into numerous hands, and was used to obtain 12 separate leases. One of which was over Allotment 5, Section 59, awarded to PNG Deep Sea Fishing for a period of 99 years beginning on 10 March 2000. The Public Accounts Committee concludes: ‘The Committee finds that certain Departmental Officers attempted to intervene and stop the Land Board and to prevent the illegal Gazettal and issue of State Leases. However, more powerful Officers were intent on achieving a result for the Grantees utterly irrespective of the Law’. The Commission of Inquiry into the Department of Finance documents the illegal activity underpinning Land Board Meeting No. 2017. The Commission of Inquiry into the National Provident Fund adduces evidence that Jimmy Maladina bribed the then Land Board Chairman, Sir Ralph Guise. The Public Accounts Committee documents the fraudulent transfer to PNG Deep Sea Fishing Limited. At the time PNG Deep Sea Fishing was awarded the 99 year state lease through a series of forged documents and illegal dealings, it was not owned by Jimmy Maladina. 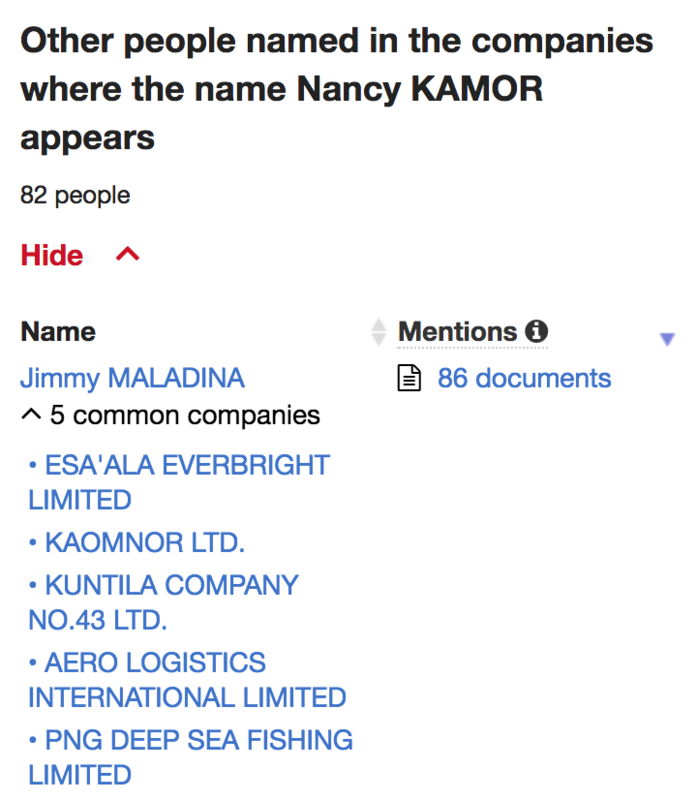 It was not until 2008 that Jimmy Maladina purchased shares in PNG Deep Sea Fishing, along with his wife Janet Karl. At the time PNG Deep Sea Fishing had one stated business activity – property owner. Janet Karl acquired a 25% direct stake in the firm, the remaining 75% share was held by Property and Investment Consultants. The latter firm is owned 50% by Jimmy Maladina and 50% by his wife, Janet Karl. So does this mean Jimmy Maladina is an innocent man, duped by Andrew Kunjip and Nancy Kamor into purchasing a ‘property owner’ company with a worthless state lease that had been acquired illegally? The first thing to note is that during 1999-2000 PNG Deep Sea Fishing’s Directors included Maladina’s wife, Janet Karl, and Philip Eludeme. In the NPF Commission of Inquiry it was concluded that Eludeme was acting as a proxy for Jimmy Maladina (a proxy is someone who formally holds shares or a position on behalf of another person, usually to conceal their involvement). A second matter of interest is the registered office and postal address of PNG Deep Sea Fishing at the time. They correspond to the residential address and postal address of Janet Karl, Jimmy Maladina’s wife. PNG Deep Sea Fishing’s registered office and postal address does not correspond with addresses used by Andrew Kunjip and Nancy Kamor. 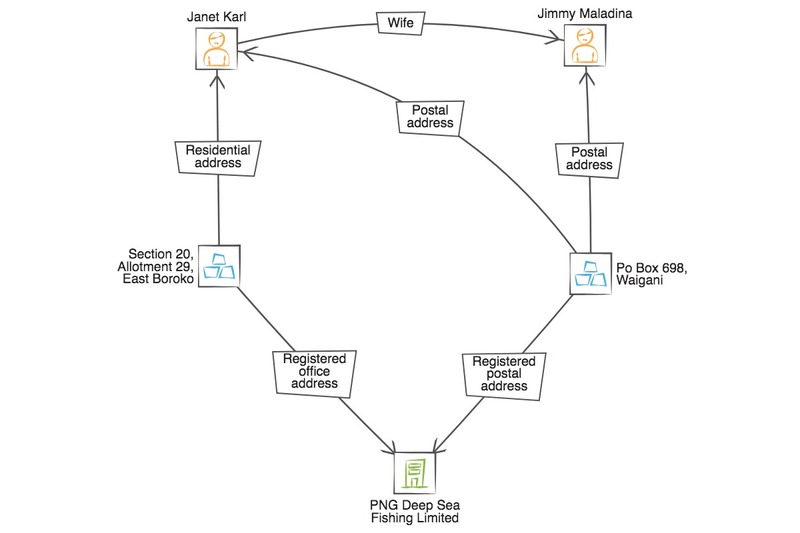 Graph: Maladina’s wife shares a residential address with PNG Deep Sea Fishing. Third, in 2008 Philip Eludeme submitted late annual returns for the company dating back to 1994. During this period Eludeme helped manage the company supposedly for the two shareholders Kunjip and Kamor. Yet he lists their date of birth as unknown. Kunjip lists his date of birth as 6 May 1965 in a document relating to another company. Eludeme’s inability to obtain this personal information does not denote an intimate relationship one would expect from a Director of a small company with only two shareholders. 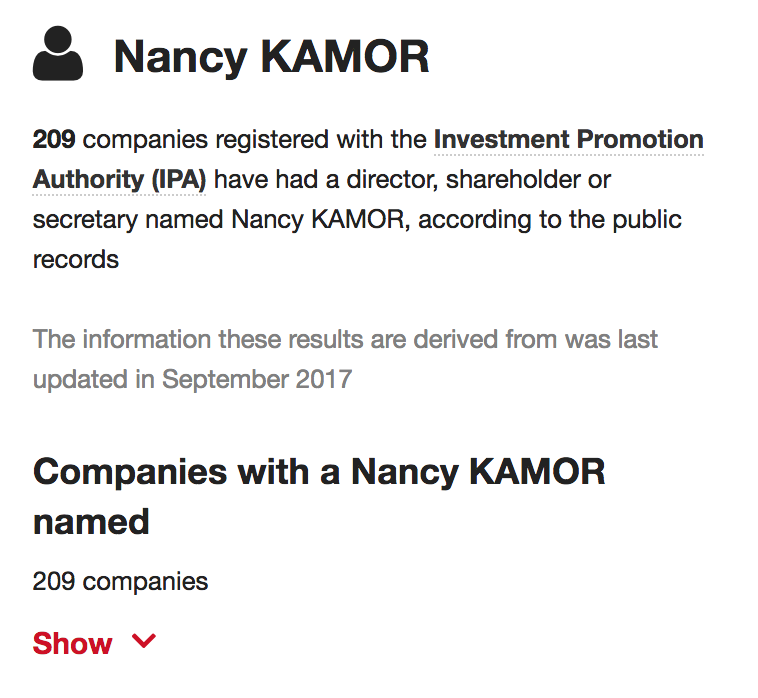 Then if we look into the purported shareholders in the key 1999/2000 period, Andrew Kunjip and Nancy Kamor are each affiliated to 200+ companies by shareholding, directorships or secretarial positions. It is critical to note that in nearly ever instance Kamor and Kunjip connection to these companies lasts between several weeks and several months. One individual both Kunjip and Kamor are closely tied to is Jimmy Maladina. All of these companies that link the two to Maladina were registered during the same time period, either on 28 April 1994 or 4 July 1994. It is also worth noting despite seemingly being such prolific business people Andrew Kunjip and Nancy Kamor do not have an online or media footprint. Combined, these are the hallmarks of individuals who are acting as proxies for a third party. Were this not ‘fishy’ enough, an almost identical corporate structure was found to be at the heart of the Waigani land scandal investigated in the NPF Commission of Inquiry. According to the Commission of Inquiry an illicit land deal – marked by bribery and fraud – engineered by Maladina took place through a shelf company Waim No. 92. Waim No.92 was owned and administered by two proxy individuals acting for Maladina, according to the Commission of Inquiry. The commission observes: ‘Mr Maladina purchased Waim No. 92 Pty Ltd from Ram Business Consultants (Ram) as a shelf company. He exercised control through the appointment of his wife, Ms Karl, as a director’. It adds: ‘Mr. Jimmy Maladina beneficially owned and controlled the shares in Waim No. 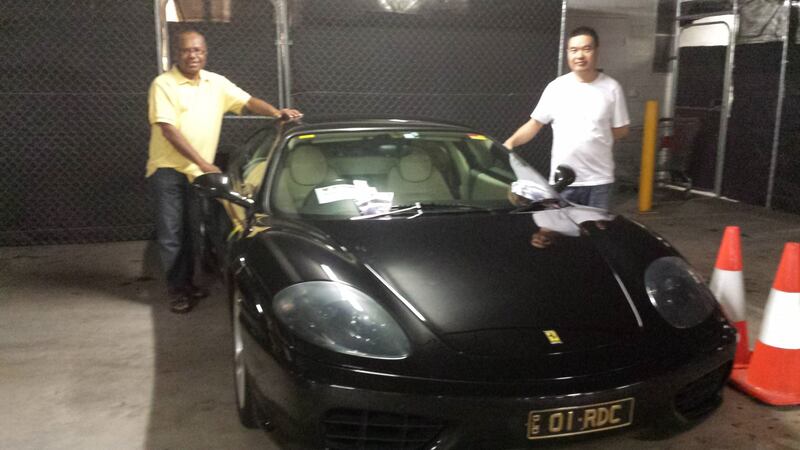 92 Pty Limited … Messrs Philip Eludeme and Philip Mamando were mere “fronts” to conceal Mr. Maladina’s interest’. All of which strongly echoes the facts presented in the case of PNG Deep Sea Fishing. Last but not least, Land Board Meeting No. 2017 featured in the NPF Commission of Inquiry. The Commission found that Sir Ralph Guise had actioned a variation of lease conditions essential for Maladina’s Waigani land sale. This variation was labelled as corrupt in the findings. 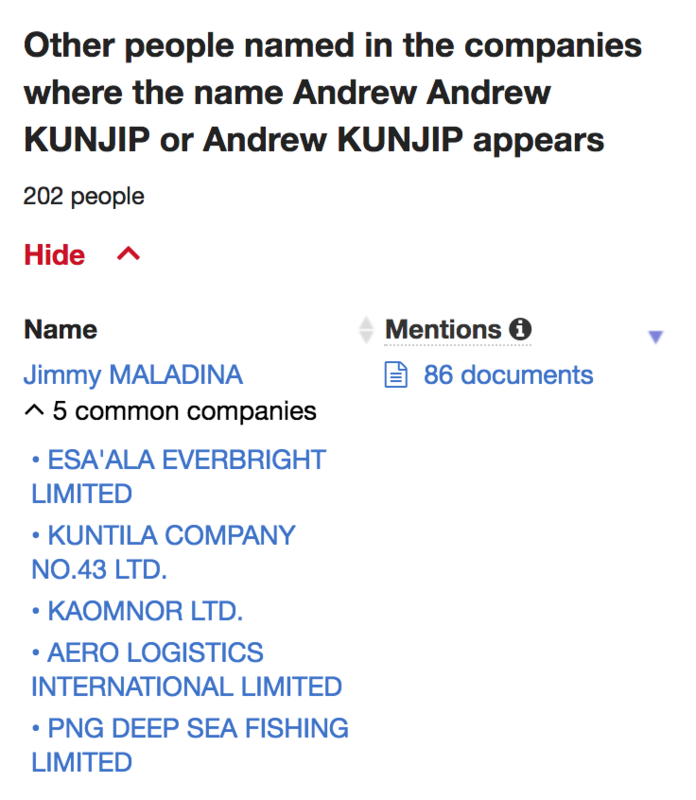 So we have here a company PNG Deep Sea Fishing, whose office is based at a family home of Jimmy Maladina, and whose postal address is shared with Maladina and his wife. It acquired a state lease through a Land Board Meeting which the NPF Commission of Inquiry claims was corrupted by Maladina in collusion with Sir Ralph Guise. In 2008 Maladina and his wife formally ‘purchase’ the shares in PNG Deep Sea Fishing from two individuals, Kunjip and Kamor. These two proxy shareholders have been involved in over 200 companies each, often only for weeks or months. They are closely tied to Jimmy Maladina. 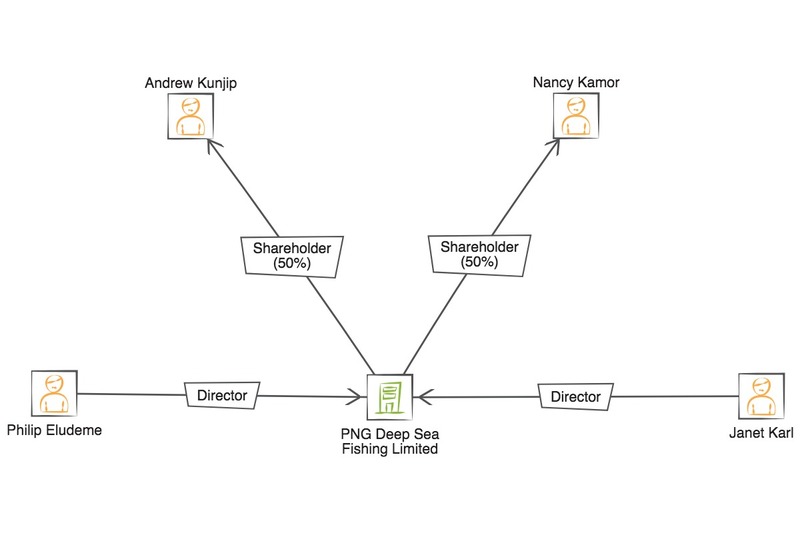 Once Maladina and his wife acquire the PNG Deep Sea Fishing shares in 2008 from Kunjip and Kamor, they initiate litigation in a bid to affirm the company’s title over Allotment 5, Section 59. Seven years later the Provincial Government emerged from this litigation victorious. Once the fraud became apparent in the state lease award to PNG Deep Sea Fishing, the Milne Bay Provincial Government attempted to regain this illegally acquired property. Their requests for the lease to be forfeited fell on deaf ears when the Lands Secretary, Pepi Kimas, was approached. It was noted by the Public Accounts Committee ‘no attempt has been made to recover these lands for the State in the last six years, despite the fact that the current Secretary knew of the illegal issue and actually publicized it in the media’. Facing a hostile Lands Secretary, the Provincial Government approached the Lands Registrar to cancel the lease. Maladina launched litigation to frustrate the Provincial Government’s actions. As a result of Maladina’s actions the Milne Bay Provincial Government was dragged through the courts for 7 years, for simply attempting to uphold the law, against a defiant Maladina. The Milne Bay Provincial Government set out in its submission to the court the fraudulent basis upon which the state lease had been issued. None of these facts were disclosed by the Appellant [PNG Deep Sea Fishing] and when the Respondents disclosed them, the Appellant merely denied them and did not file any affidavit material in rebuttal that set out evidence disclosing facts demonstrating the Appellant following all set procedures under the Lands Act and all other relevant and applying legislation and that title over the land, the subject of the proceedings, was properly vested in the Appellant. Nevertheless, the case continued for another four years. It was only on 9 May 2014 that PNG Deep Sea Fishing elected to discontinue the proceedings. Deputy Chief Justice Salika was damning of PNG Deep Sea Fishing and Jimmy Maladina, awarding costs to the Milne Bay Provincial Government who had been dragged through the Courts for simply upholding the law. In this case the plaintiff was aware or ought to have been aware that the purported grant of lease over Allotment 5, Section 59, Alotau was not proper or legal in that there was never a Land Board meeting that recommended the grant of the lease. In my view therefore the matter might have been settled between but instead this protracted litigation was commenced and the defendants were put to unnecessary litigation by the plaintiff and made to incur unnecessary costs. Seven (7) years on the plaintiff has now only come to its senses that it could not succeed and now this application to discontinue the proceedings. The proceedings had no merit right at the outset and yet it took some 7 years to put to bed. In the circumstances, I am minded to award costs to the defendants on a Solicitor/Client basis and I so order. According to the Commission of Inquiry into the Department of Finance, Land Board Meeting No.2017 was tainted by fraud. The NPF Commission of Inquiry argues it was also tainted by bribery and corruption. The Public Accounts Committee argues it was one of the most criminal Land Board meetings ever convened. As a result of this it appears that real property belonging to the people of Papua New Guinea was fraudulently acquired, through a corrupted Land Board. A key beneficiary of meeting no. 2017 was PNG Deep Sea Fishing, which acquired a prime urban property. 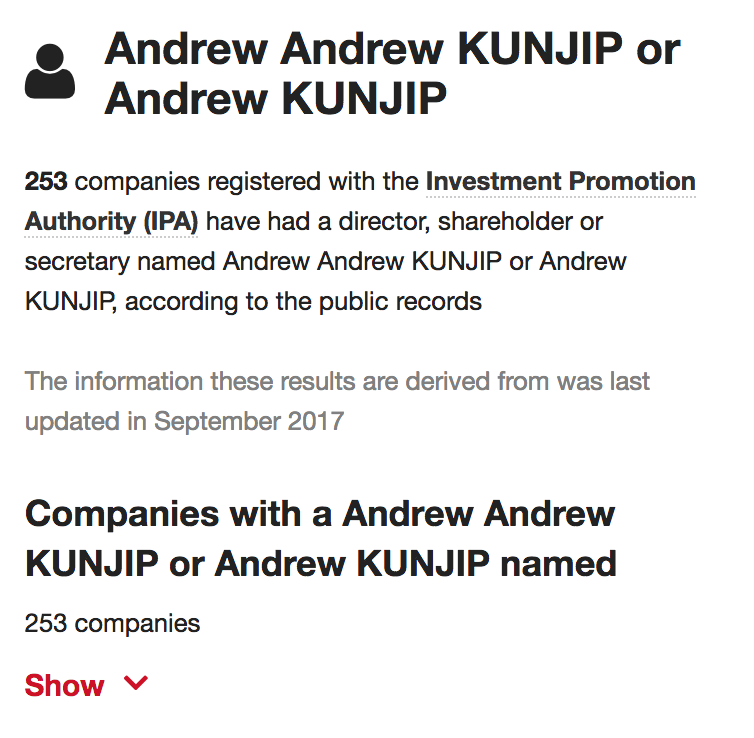 While Andrew Kunjip and Nancy Kamor appear on paper to be the owners of PNG Deep Sea Fishing, evidence adduced here suggests they were proxies holding the shares on behalf of a third party. In light of PNG Deep Sea Fishing’s close links to Maladina (shared address, wife is the director, linked to Kunjip/Kamor), the documented involvement of Maladina in Land Board Meeting No 2017, the documented use of proxies by Maladina, and his subsequent litigation, it strongly appears Jimmy Maladina was the third party. And this is not ancient history. The struggle to save this property only ended four years ago after seven years of litigation. Now it is up to the RPNGC’s Anti-Fraud Directorate to determine whether enough evidence still exists to consider charges under the Criminal Code 1974. Given that two Commissions of Inquiry and a Public Accounts Committee investigated this matter, there is a significance chance documents essential for such investigations are still accessible. All too often land is lost to illicit deals, the SABL inquiry is evidence of this. Yet if land is lost through fraud and deceit this is not a mere matter for tongue clicking. Its a matter for the police.